In April 2003, Aron Ralston went hiking in Utah. Five days after entering the Blue John Canyon, he staggered out, having undergone extreme deprivation and self-sacrifice in order to survive. Whilst climbing, a boulder had become dislodged and trapped his arm. With little food and water, Ralston was ultimately forced to amputate his own arm to escape. 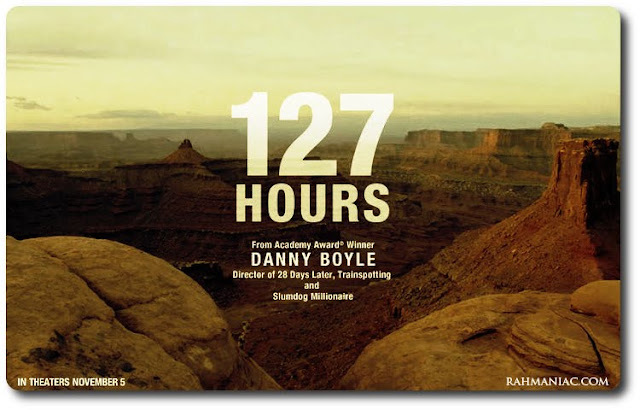 127 Hours, the latest film from Danny Boyle (Trainspotting, Slumdog Millionaire) tells the story of Ralston's ordeal. Before I get to the meat of the review, I feel that I should presage it with a bit of information about my personal reaction to the film. Not to the amputation scene - though, for the record, I decided not to look away as Ralston (played with fierce intensity by James Franco) sawed through his arm with a dull blade, but I did spend that minute or so digging my fingers into the armrest of my chair and shuddering involuntarily - but to the film as a whole. Firstly, as soon as the film, finished I had to go and have a glass of water, purely because watching Aron struggle through the last half an hour of the film without any water had given me sympathy thirst. That doesn't seem quite so strange, but as I was walking home I found myself overcome by a wave of profound, overwhelmingly joy. Obviously, that seems strange considering that I had just watched a film in which a man was forced to mutilate himself in order to survive, but I felt such a strong sense of empathy for Ralston, and such an elation at knowing that he somehow managed to survive an experience that I can't even begin to imagine, that it was the only logical response. 127 Hours is a film which relies heavily on empathy for its effect, and if you identify with Aron Ralston, even if you can't imagine ever being able to do what he did, then the film can have a really powerful impact. To that effect, the film works almost better as a sensory experience than as an intellectual or emotional one. There is a heavy emphasis on Aron's senses and the way in which the smallest object or action can be of vital importance. Every spilt drop of water, every second wasted, every minor victory has a weight and gravitas to them that belies their scale but fits the situation. Whether or not Aron can use a stick held between his toes to pick up a dropped tool could quite literally be the difference between life and death, and Boyle does a great job making every ounce feel like a ton. Danny Boyle also tones down his usually kinetic style to tell Ralston's story. The restless, fidgety energy that has defined his films ever since he set shots of Edinburgh's streets to Leftfield in the opening of Shallow Grave is, with the exception of an opening ten minutes which is full of typically fevered invention and pounding music, largely absent. The film judders to a halt when Aron's accident happens, and just as Aron is stuck under a rock at the bottom of a canyon, so are we trapped down with him, and the moment when the camera stops moving, and instead rests on James Franco's face as he starts to comprehend the situation that he is in, is probably one of the finest - and quietest - moments of Boyle's career. It also helps that, in James Franco, he has found an actor who can embody the arrogance, determination and sense of self-realisation that is crucial to Ralston's story. Throughout the film, Aron talks to a camera that he brought with him. These scenes have a certain playfulness to them, since Aron uses the camera as a chance to talk and keep himself sane, but they also bear a raw, confessional quality since Aron thinks that in all likelihood the tapes will serve as a document of his last days alive. Franco and Boyle sometimes switch from one to the other in a single scene, such as one in which he pretends to be interviewing himself on a talk show - complete with audience laughter - which then shifts to a heartbreaking moment in which Aron apologises to his mother for not returning her phone calls. It's a wonderful scene that demonstrates why James Franco is one of the finest, least understood actors of his generation. Ultimately, Aron finds it within himself to do what he needs to so that he can escape, and the film somehow makes his act triumphant (as well as grisly and nerve-shredding) and I, for one, was moved by it. As I've already said, the film had an unexpectedly powerful effect upon me, so I can't guarantee that anyone who goes to see it will have anywhere near the same response. But it's got to be worth going to see if you do.